Our new neighbours have been clearing out their garden shed. The house had belonged to a 92 year-old lady who had lived in it for 90 years. Among the gardening tools, they found this. Has anyone any idea what it is for? Suggestions? It is about 18 inches/45 cms long. It has an iron head and the shaft has a leather handgrip. It looks a little like something a medieval knight might have wielded, but not something a well-bought-up lady would be using in her garden. 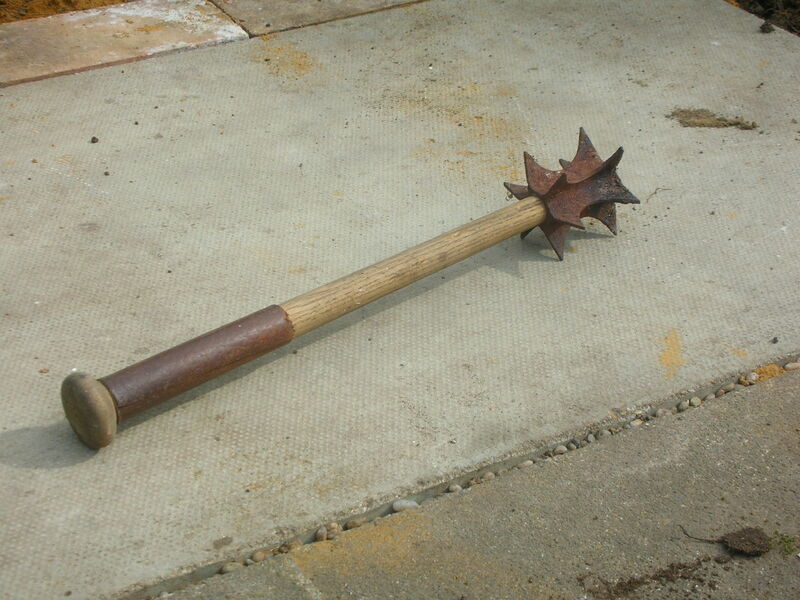 It is clear from pictures on the Internet – thank you Koji – that this is a flanged mace. This was used as a weapon in armed combat in Roman and medieval times (for penetrating armour) and is still used for a variety of ceremonies today. As this one is relatively light and short and presumably modern (i.e. within the last 150 years), I assume it is ceremonial, though these usually have rounded flanges and more ornamentation. It is, in spite of its size, a dangerous weapon. This entry was posted in Gardens, Uncategorized and tagged ancient, antiques, ceremonial mace, flanged mace, garden tools, gardening tools, mace, toolshed by hilarycustancegreen. Bookmark the permalink. I dare you to make up a novel about it. I wouldn’t want to actually find out. Imagining what it is and what she might have used it for is much more fun! What a challenge! I might weave it into the one I am working on at the moment, which has a sufficiently eccentric middle-aged woman as one protagonist. Thanks. Really, you came up with it. 🙂 Sometimes we just need another “pair of eyes” or something . . .
Well, I hope it wasn’t used to keep an errant husband in line.? 😉 Perhaps it was used to beat back weeds, thistles or so. No husband, though I was quite scared of her until I got to know her. Never saw anything like that. It looks more like a backscratcher for a rhinoceros. Love it; that’s probably the only safe use for it too. Hilary… That looks straight out of Mel Gibson’s “Braveheart”. I can’t imagine it being used for anything but you-know-what. Perhaps it was used to kill livestock? I agree, but I know she had a fear of rats, so I can’t imagine her coping with anything bigger. You are likely right, Hilary. In fact, there was a silly youtube of someone making something like what was shown in your photo and mashing watermelons! Not in the UK… though come to think of it, our village has a zoo. No gophers? You don’t know what you are missing. I’ll be moving there tomorrow.